Diablo III’s anniversary update delivers some good, clean old-school fun, but one of its reward pets, the Royal Calf, suggests our trip to Old Tristram may have been the reason the series’ bovines have been so damn angry for the past two decades. One of several secrets hidden within the Darkening of Tristram event in Diablo III, obtaining the Royal Calf pet takes a bit of doing. It all starts by picking up the Rotten Mushroom item on level nine of the anniversary dungeon. That mushroom, when applied to the cauldron located in the retro version of Tristram, becomes a Witch’s Brew. Then it’s time to go back to the bottom of the map and hop from NPC corpse to NPC corpse, trading one item for an other, until eventually you get the plans for Wirt’s Leg. It costs one million gold to craft Wirt’s Leg, which is pretty pricey for a thing you’re going to demolish immediately to obtain a Star Map. The map tells us the order in which to click the cow corpses in retro Tristram in order to open a portal to the Abandoned Farm House area. This still taken from a YouTube video, as I did not have a million gold. In a chest in this normal cow-infested area, you’ll find the Royal Calf pet. Image via the Diablo Wiki. Cute, right? A little cow to follow you around. No harm in that. 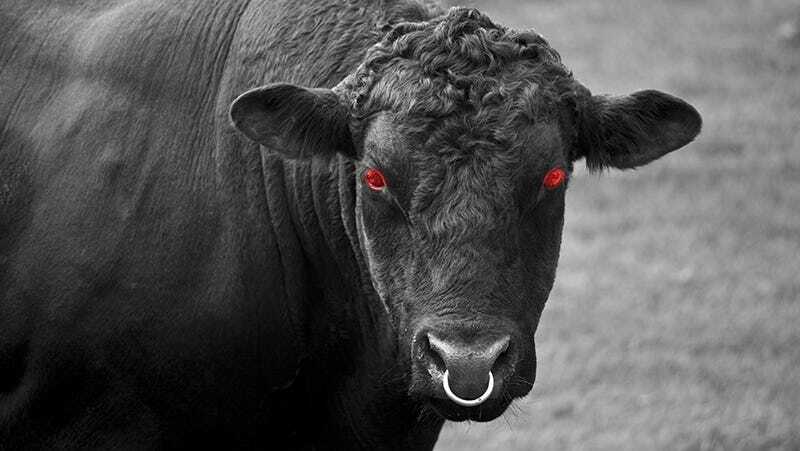 Redditor Gyrfenix suggests our acquisition of the Royal Calf has much more sinister implications, and I tend to agree. During this event, you’ve essentially “gone back in time” to where Diablo first began. Thus, when you steal the Cow King’s baby in Wirt’s farmstead, which is filled to the brim with his cows, it implies that YOU are what causes the bovines to turn evil - because they’re searching for the royal calf you stole.